President William J. Clinton, who had campaigned as a new kind of Democrat, nominated Arthur Levitt, former Chairman of the American Stock Exchange, as SEC Chairman. 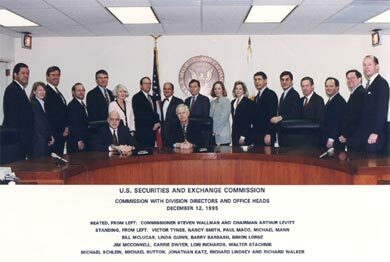 Levitt would lead the SEC throughout Clinton’s two terms, becoming the longest-serving SEC Chairman to date. Financial Modernization: Gramm-Leach-Bliley Act of 1999 - SEC and "Functional Regulation"
"Derivatives: Regulatory Oversight for Plan Sponsors and Advisors" - Remarks of SEC Commissioner J. Carter Beese, Jr.
Stock Option Accounting: A Common Sense Approach - Remarks by SEC Commissioner J. Carter Beese, Jr.
"Derivatives at the Crossroads" - Remarks of SEC Commissioner J. Carter Beese, Jr.
"Managing Derivatives Use in the 1990s" - Remarks of SEC Commissioner J. Carter Beese, Jr.
Congratulations to Catherine Spain, Government Finance Officers Association from SEC Chairman Arthur Levitt on publication of "Questions to Ask Before You Approve a Bond Issue"